The Primo Oval G 420 transcends standard gas grills by integrating a premium grade ceramic shell. 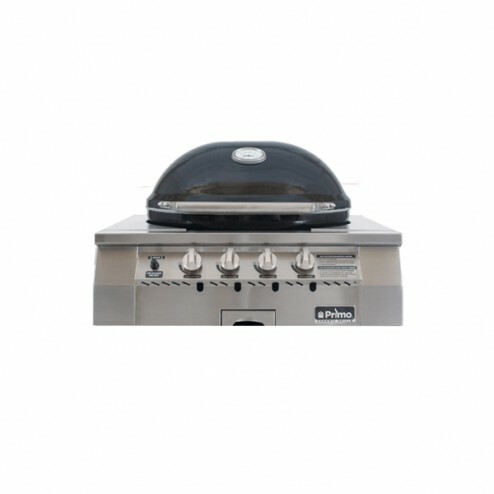 Unlike metal gas grills that radiate high amounts of heat and pull the moisture out of food, the ceramic shell of the Primo Oval G 420 acts as an insulator to retain more heat and preserve the natural moisture and oils of the food.The assembled grill features premium grade ceramics, 304 stainless steel cooking grates, burners, flavor grids, exterior and components. The cart features brushed aluminum handles with a powder coated steel exterior and locking casters. Every Primo is built for years of use and enjoyment.